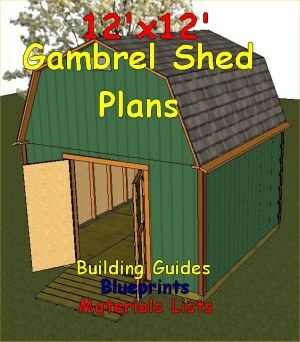 12x12 barn shed plans will give you lots of storage space. Plans for shed loft, ramp, windows, and doors included. 12'wide x 12' long small barn plans. All 2x4 constructions with 12" on center treated floor joists. 2' on center wall studs and roof trusses. your gambrel style roof much easier. 5' double swinging shed doors. Plans show 'smartside' pre-primed siding panels. Shed ramp construction plans and additional plans for adding more windows or doors.